A small but significant study that looked specifically at heart function found that adults in their sixties who had actively engaged in exercise over the course of their lives had more youthful mid-sized and large central arteries, as compared to those who exercised less intensely or less often. Unlike other studies that look to improved risk factors such as lowered blood pressure and blood sugar for better cardiovascular health, this study, published in The Journal of Physiology, focused solely upon the effects of exercise frequency and intensity on heart muscle and blood vessel plasticity. 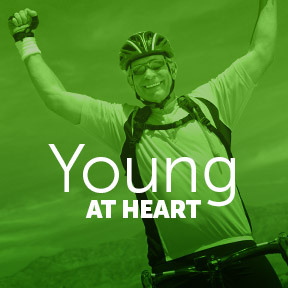 The researchers found that those who routinely participated in moderate- to high-intensity exercise four or more days per week over a period of years decreased their “heart age” by 15 to 20 years. Those with a history of exercising two to three times a week showed some benefit for mid-sized arteries that supply blood to the head and neck. However, those who exercised four to five times a week had healthier large central arteries that supply blood to the chest and abdomen. Even when we are healthy, as we age the heart and blood vessels naturally lose flexibility. This can result in breathlessness, reduced oxygen efficiency, and an inability to effectively pump blood to the lungs and throughout the body. While the study showed that any amount of exercise reduced the risk of heart problems, the right amount of exercise at the proper time appears to slow the cardiovascular aging process, increasing the chances of a longer, healthier lifespan. Poor fitness in middle age is a risk factor for heart failure; largely through increased ventricular stiffness, a consequence of sedentary aging. The researchers concluded that those who develop a regular exercise routine ideally before age 65 may see dramatic improvements in heart and whole body health. Dr. Benjamin Levine, professor of internal medicine at UT Southwestern Medical Center and founding director of the Institute for Exercise and Environmental Medicine, recommends a high intensity workout at least once per week, moderately intense exercise two or three times a week, and an hour of fun physical activity on the weekend. Fortunately, for those in midlife who haven’t been avid exercisers, getting in shape now may head off decline and help restore an aging heart. L-Arginine Complete Pineapple by Fenix Nutrition: In addition to specific vitamins and minerals, this product is formulated to provide L-Arginine and L-Citrulline, amino acids that have been shown in scientific studies to increase nitric oxide production, resulting in cardiovascular, immune boosting and sexual health benefits. BergaMet™ Metabolic Support by BergaMet™: BergaMet’s bergamot extract has been clinically shown to have beneficial uses that support and promote healthy cholesterol, as well as cardiovascular, immune, and metabolic health. This naturally sourced organic superfruit provides high levels of antioxidant polyphenols. Gluten, wheat, dairy, egg and lactose free formulation. Cardio Plus® CoQ10 by Priority One®: Formulated to promote energy production in heart muscle cells, this synergistic blend of balanced nutrients provides support for a healthy cardiovascular system. Ingredients include CoQ10, hawthorne berries, selenium and chondroitin sulfate. CurcuminRich® Cardio Optimizer by Natural Factors: This product provides highly bioavailable turmeric extract, as well as pharmaceutical grade EPA and DHA in support of healthy heart function. Gluten, wheat, soy, yeast, dairy and sugar free, Non-GMO formulation.